Long Story Short: Owen hurt the feelings of an ineffable monster in another dimension. As a general principle the second novel is more important than the first. Anyone can write an interesting book, given enough effort and time. The amount of people who a second interesting book is much smaller. (Of course Larry is far beyond this at this point.) If The Empire Strikes Back had been a flop we would not have Star Wars as a thing these days. Vendetta succeeds at this. Many of the writing bad habits that bothered me from the first book have been ironed out. (Although, Larry still used “Stated” for about a third of dialogue tags. Just one of my pet peeves.) The gun lingo has been dialed down but is still ever present. I’m not saying it’s a bad thing, every writer loves their own expertise a little more than their readers. I do remember a time or two where I felt I was missing something by not know what the gun a particular character pulled out looked like. Pacing is less breakneck than the first book. It was nice to have time to puzzle out the mystery before revelation. Vendetta isn’t shy about hitting the emotion button. Long story short: The consequences of having psychic powers starts to hit the group. This is a different animal from Hidden Talents. We get the POV of various characters and the stakes are much higher. It is less focused because of this but Lubar manages to tie all the threads together. My favorite part of this book is that the boys have ambition, well most of them. They are working toward a goal, they have a plan. The great thing about the Talents series (of which I hope we get another book so we can figure out what this “pattern” stuff is all about) is how lowkey it is about the powers. They aren’t flying around saving the world. They are just kids trying to figure crap out. 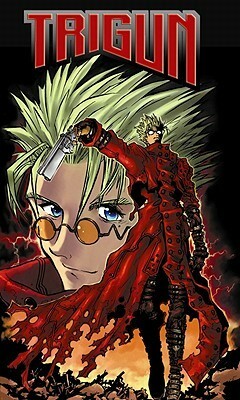 Long story short: On a inhospitable planet colonized by humans, the force of nature known as Vash The Stampede tries to save everyone who is trying to kill him, while being pursued by two intrepid insurance adjusters. I luckily found this and volume 2 at a thrift store. There was also a whole shelf of Narutos, but Naruto is kinda the point of no return. (Don’t worry I looked away for a second and the Narutos had disappeared, they are off running at a tilt somewhere.) I’m not sure if I would have picked it up had I not already seen the animation. Sometimes it’s hard to tell what’s going on, if the pacing were pulled back a little I think it would have worked better. Anyway, depending on your tolerance of manga this is a great one. Well 2016 sure was something. Personally it has been pretty good. Being out of school has allowed me to think my own thoughts. Having a vacation from work has allowed me to examine my goals and priorities. I’ve been writing far more often. My midsingles ward feels like home and people know I exist. The prevailing meme these last few months has been 2016 worst year. Yeah, there was a lot of awfulness. Infighting among our super heroes. We have lost so many real life legends. I have lost friends and family. Our two party system asked us to choose between the worst candidates. Wars and terrorism burned daily across the planet. Heroes are redeemed, that’s how stories work. There will always be room for new legends, we need to work to be them. Making new friends doesn’t dishonor the old ones. Loving the family we still have doesn’t desert those not with us. As always we need to oppose or support our elected officials at every turn. We still have a constitution. I don’t know how to salve the world’s suffering. New years resolution: don’t bend the wookie. So that’s a relief. My resolution was broken minutes into 2017. Actually I usually try to write 100 goals. They have to be crossoffable and are often books I want to read or artistic endeavors I want to work on. I usually don’t reach 100 and forget about it but still it is good to plan. Right now I’m sitting at 47. This year I’m going to keep those in the back of my notebook that I carry with me everywhere. If I fill that notebook then I’ll transfer the goals to the new notebook. Another technique I have picked up is a weekly goal journal. You list three goals. The goals have to be measurable. Measurable is like: get to sleep by ten, write three blog posts, don’t eat ramen for every meal. Unmeasurable is like: be happy, exercise more(unless you track your exercise), be less vague. Every morning you look in the journal to remind yourself of your goals. Then every night you review your goals and write out how you did. The important thing with this goal journal is it not be an overlord. If you didn’t work on a particular goal that day just write that, no biggie. Renewal is important. It prevents late fees and gives more breathing room. The important thing to remember is that if the rules you impose on yourself are hurting you you can break them. One thing I find frustrating is adults who feel the need to apologize for their reading habits, whatever those habits are. Nearly everyone does it. “I don’t read as much as I should.” “I don’t read very fast.” “I don’t read anything important.” “I read too much.” My question is: who set these rules? Is there some reading authority out there telling people that reading is a competition? One must read the right books at the right speed in the proper amount. Is there an award for the person who most meets these guidelines? Are the judges secret so one might be talking to a judge at any time? Must we be ready at all times to give the proper answer or face serious consequences? Anyway, what I’m saying is that english teachers aren’t the owners of your reading soul. They aren’t the arbiters of your worthyness once you leave class. All they can do is make a mark in a card that you will eventually throw away. You don’t have to answer to them if some random person wants to talk books with you. Generally speaking, most people don’t have time to judge your lives. We’re all too selfish to think of the whole ramifications of someone else only reading two books a month. (Or year, or decade.) When people want to talk books, despite their own insecurities about it, they actually want to talk books. Lets work on not waste those moments on the confessional box.